Steve Edge World / Home / Steve Edge World / The 10A Scalpel Blade – Steve Loves It! 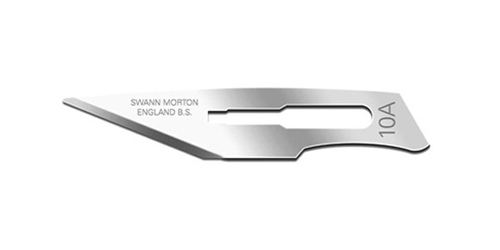 Steve loves the Swann-Morton 10A scalpel blade. Known for their use in surgery, they have been a daily tool for Steve ever since he started exploring art and design. Perfect for all handcrafts including lettering, model making and producing stencils, they are invaluable tools for a commercial artist. You will still find a stash of them in Steve’s studio today! I’m also a big fan of the 10A blade and to a lesser extent the 11A,when a finer point is required. However recently I find that I’m slowly becoming a convert to the sharper ceramic scalpel blade. Look forward to meeting you again soon, when maybe we can discuss the issue further and at greater detail.